I am a grumpy lady right now, and as often happens, I’m not even sure why. Because Greg wanted to watch the end of Titanic tonight after I got off work? Probably not. Because my upstairs neighbors sound like they are bouncing a basketball on their floor at 1 AM? Maybe. Because the hormones in my body are raging through my system, creating a path of destruction through all normal emotions? Most likely. And I am suffering from Netflix withdrawal. Can I just finish the last season of Battlestar Galactica??? 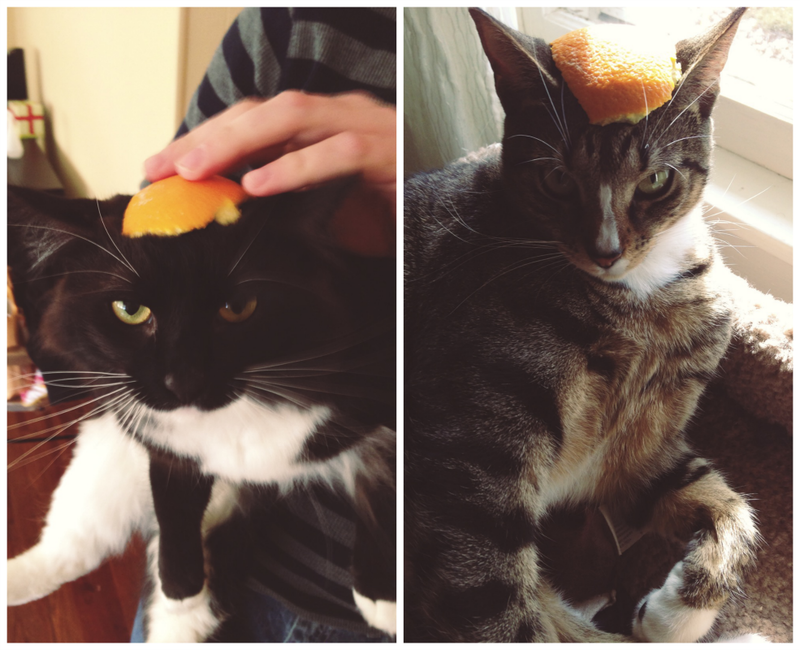 – My cats “let” me put orange hats on their heads. – It’s almost payday. The Christmas festivities really got the best of me. Not to mention the electric bill in this frigid weather!! – I went to Trader Joe’s so I actually have FOOD I can cook for work now, instead of making leftover freezer remnant concoctions (remnants of my freezer contain a couple mini tamales, frozen corn, and pizza veggie burgers). – We applied for passports this week (let the travel planning/freaking out begin! ), so I hope we hear back on the progress soon. – We have escaped the winter vortex for now and it’s going to warm up this weekend. It is currently 25 and feels like 25, according to Weather Channel, which is much better than 13 and feels like -8. Next Post What’s In My Cloud? haha I love that they 'let you' even though they both look murderous. Adorable, hilarious. But murderous. Bummer moods are no good. Hopefully you getting feeling perky and happy soon! P.S. I'm totally excited for you that your cats “let” you put orange hats on them. My cat would just as soon claw my hands to pieces lol! You are incredible :)!! I would love to cuddle a baby elephant, but even the baby looks huge??? Poor guy's gonna get squished. I feel your paaaaain. Put weird things on things on your boyfriend's head? Put weird things on stranger's heads? Put weird things on your own head? I will, just some mood swings making their crazy rounds :). O jeebus – I really can't complain when compared to you Canada folks. You've got it much rougher up there!! It felt like -8 here and I was afraid my eyeballs were gonna freeze. Oranges are their favorites. I don't think they had ever seen one before. My cat came up for cuddles and I had orange-smelling hands; he kept squinting and shutting his eyes, so naturally we had to put it on him.